I recently spent a brief amount of time over the weekend in Mumbai, a city I previously lived in for four years, to catch up with old friends and try out new restaurants. Mumbai is big on the food scene. Restaurants pop up and fizzle out so very often, you really need to be on the ball and play catch up if you are the type to explore new dishes at new restaurants. So whilst I was at lunch with my friends at one of my favourite restaurants called 'Salt Water Cafe' in town (their honey cinnamon roasted chicken is avoidable, go for the Kingfish instead), I was told that a new "up scale" dining spot called 'Nico' was only recently launched and the food there was "on a whole different level" (well, at least that's what my friend claimed). So, that was that, I wanted to experience some culinary elevation. 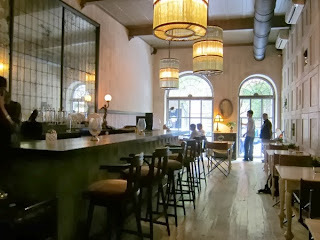 Located in Kala Ghoda, we did have to walk around a bit to find Nico. Of course we tried Google Maps but it seemed the restaurant wasn't yet listed on it. But the breezy December weather made the walk a pleasant one and stirred up quite an appetite. We spotted the restaurant and walked in. We didn't make a reservation and a server led us to a table on the condition that it be released by 10PM so that it was vacant for the guests that did take the effort to call and reserve a table. Fair enough. I liked the interiors at first glance. Elegant and rustic touches were lent by the subdued colours and the wooden elements in the flooring, the walls and doors. My friends thought the lighting was a bummer though - dull to the point of near darkness they wouldn't be able to see what they would be eating! But I was focussed more on how uncomfortable and out-of-sync the chairs were. They reminded me of those light fold-able chairs you see at a beach. I didn't think they fit in seamlessly with the interiors. But a chair is a chair is a chair. We asked for water and were told they only serve bottled water from the Mulshi springs and ONLY bottled water from Mulshi springs. Yes, we get that the restaurant is fancy-schmancy and their offerings should also speak the same language (read: la dee da), but for something as basic as water, I think that compulsion should not be imposed and 'regular water' should be an option that is offered, especially to diners on a budget. What was also a surprise to us was the complimentary champagne that was offered in a really beautiful little glass. We drank it out of thirst but we'd have been happier if they skipped offering that and gave us unlimited supply of regular water instead. Moving on, Nico has a pretty bar. Well aligned and spotlessly clean, it was a place you could imagine being confidently seated all by yourself accompanied only with fine wine. Given that our table was right opposite the kitchen, my glance was affixed on the Chef. She mildly reminded me of Miss Trunchbull from the Matilda movie. She seemed upset yet at the same time peaceful as she quietly plated dish after dish and dish after dish barely uttering a word to her colleagues in the kitchen. The menu was not massive (thank god!) and had an assortment of salads, mezze, pizzas, main courses (duck, ravioli, spaghetti) and desserts. Pricey as expected but I'm okay with that as long as I'm amazed with flavour. We ordered for two pizzas - Davide (Smoked Aubergine, Vine Ripened Tomato and Ricotta) and Gorus (cannot recall the toppings ), and a Pan seared Rock Fish, Clams, Swiss Chard. I honestly cannot recall what toppings the Gorus had but we liked Davide better anyway. The tomato sauce was perfect but the dough bed it was layered on was a bit off. I personally found the dough base a tad too salty, the thickness was just about right but the texture disappointed me a bit - there was reasonable effort to be invested in every bite - it was chewy rather than soft. My other complaint with the pizzas were the sparse toppings. Moreover, the toppings on the Gorus came right off the base the moment you tried to slice one out for yourself. The pizzas came in a ten inch size and two of them were filling enough for a table of three hungry diners. The fish was a good dish though - well-plated, good portion size and balanced on flavours. All in all, it was a very average experience. Some hits and misses. You may have had a different experience altogether. I think restaurants like this that dare to offer something unique, authentic and off the hook should be encouraged but more importantly, they should ensure they get the basics right and that diners are given their money's worth; at the end of the day, all you want to achieve is that your guests are happy with the dish they've shelled out money for and this time, we just didn't belong to that lot. Nico, for me was more fluff, less flavour. All I could read was "more fluff, less flavour". Watch out Nico! I had a pretty so-so experience. Brilliant appetizers, fabulous ambiance but the main course was a let down. I would still go back to load up on some more appetizers and try out the Sinclair's Duck. Hi Shradha, thanks for sharing your blog. Saw that you're from Melbourne! I stayed there for two years before I went to Bombay to work. I miss Spanish churros, Krispey Kreme and Lygon Street the most!